HomeFor ClientsAnalyticsForex Analysis & ForecastsForex Technical analysis and forecastsForex Technical Analysis 2010/11/01. EUR/USD, USD/CHF, AUD/USD, USD/CAD Forecast FX. Forex Technical Analysis 2010/11/01. EUR/USD, USD/CHF, AUD/USD, USD/CAD Forecast FX. As you can see by eurusd forecast, the price is testing the upper side of the “triangle”, one can try the tight stop sales. The 5th point of reference will be formed in the area of 1.3460-1.3440, where the EUR/USD currency pair is expected to grow to the level of 1.4800. In alternative scenario the pattern will be broken upwards, in this case one should try to buy the pair with the target in the area of 1.4250. In case of Franc the target of the rising pattern is the area of 1.0020. 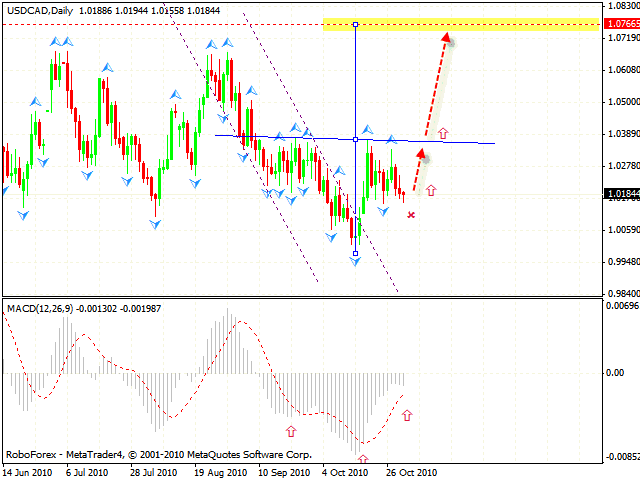 According to technical analysis usd chf, you can try to buy the pair with the tight stop. 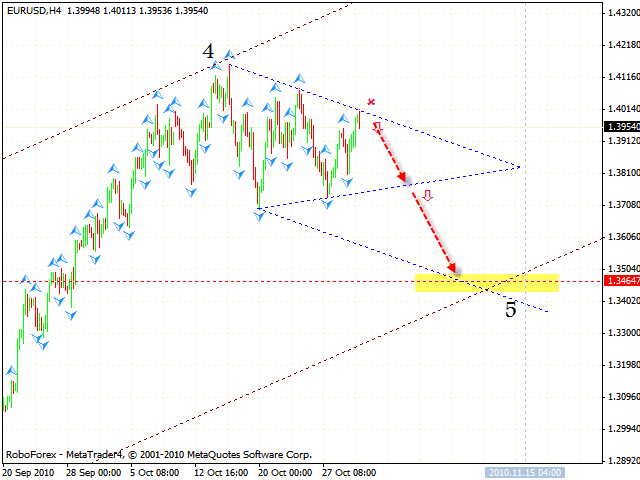 After the “triangle” is broken we can try to increase the amount of long positions. If the price leaves the rising channel, we should consider selling the pair with the stop above the local maximum. The descending symmetrical pattern which has been completed by Australian Dollar indicates that the price is going down to the area of 0.9600. 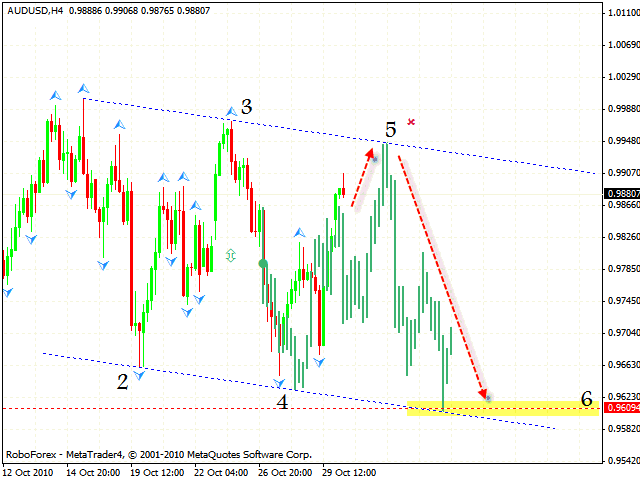 Judging by aud usd analysis you can try the tight stop sales near the channel’s upper border. 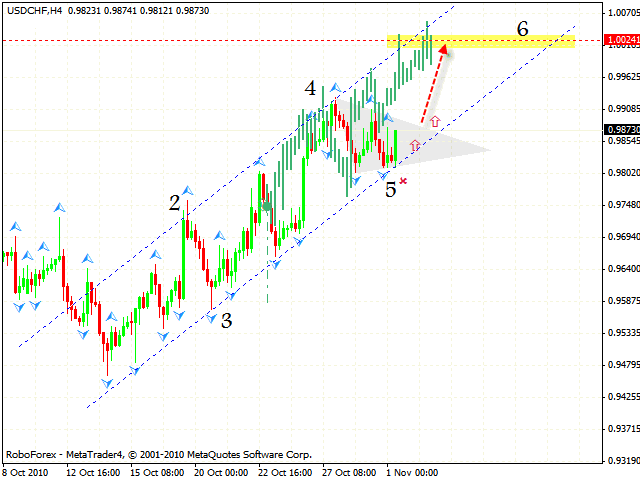 In case the price beaks the channel upwards one should consider buying Australian Dollar. At the forex online trading daily chart of the USD/CAD currency pair we have “head & shoulders” reversal pattern forming with the target in the area of 1.0766. The same pattern can be seen at the MACD indicator. Judging by usd cad analysis you can try to buy the pair with the tight stop. In case the price continues to move upwards, we shouldn’t increase the amount of long positions until the neckline is tested and broken.